Phone manufacturers are trying their best to give users the tools they need to protect themselves. We have physical input security like pins and pattern locks which are not secure anymore. As a result, today's smartphones are being armed with biometric security, such as fingerprint scanners, iris scanners and the latest face unlock technology... this means your fingerprint or your iris or your face is your password. Though Apple iPhone x touts its face unlock as a better option than the fingerprint scanner, it is the fingerprint scanner is the still most reliable and cheapest solution till date. The fingerprint scanner is not new technology; in the past, it was embedded in laptops and even in earlier generations of smart phones. At that time, though, the technology did not prove popular with users. The fingerprint scanner, which has evolved from optical to capacitive, continues to improve. The optical fingerprint scanner creates a 2D image of the user's fingerprint and compares it with the stored version of the fingerprints in its databank. If one were to explain technically, the fingerprint scanner takes a high contrast photo of the user's fingerprint by flashing light on the finger through a prism. This is then reflected to the image sensor adjacent to the other side of the prism. The higher the image sensor resolution, the greater the number of details captured. With the use of an algorithm and specific markings on the fingerprint made on the user's earlier stored fingerprint data, the scanner analyses the fingerprint as part of the authentication process. As the user's fingerprint is stored as a 2D image, there is a possibility that the fingerprint scanner can be easily fooled by scanning a high resolution image imprint of the user's fingerprint. Secondly, the optical scanner module consists of a glass prism, LED diodes and an image sensor... all quite bulky and difficult to fit in a modern day slim profile design. This paved the path for the alternative capacitive scanner. The modern day smartphones have opted for the capacitive fingerprint scanning technology, which has the added benefit of being cost-effective. Also, capacitive scanners are more secure than optical scanners. As the name suggests, capacitive fingerprint scanners are based on capacitors. Unlike the optical fingerprint scanner, the capacitive scanner generates a digital data image of the fingerprint scanned. An array of tiny capacitors are arranged to form a circuit that is connected to conductive plates placed below the scanning surface. The capacitors are smaller than the fingerprint ridge and are placed close to each other, spanning the entire scanning surface area, to capture a high resolution digital image of the fingerprint. The capacitors store electrical charge. When a finger is placed on the scanning surface, there is a small change in the electric charge of the capacitors below the finger ridges while the capacitors below the gap or the so called valley between the ridges do not register any change in the electric charge (see image above). This analogue data is converted to digital data as a fingerprint image and stored for authenticating the user's fingerprint or to match other fingerprint data stored earlier. It is difficult to fool the capacitive fingerprint scanner as it creates a 3D image of the fingerprint that has been scanned. Trying to hack into it using a prosthetic, an image or any other material would be difficult as each will have a different effect on capacitors's electrical charge, generating a different signature. The optical scanner we had mentioned earlier is not dead yet due to the race towards a bezel-less display. Many smartphones still have the fingerprint scanner in front, with the most ergonomic space being the front bottom of the screen. The Vivo had demonstrated the under display fingerprint scanner in its concept phone, Vivo X20, at the Consumer Electronics Show 2018. It is now available commercially available as the Vivo X21. The sensor lies embedded underneath the OLED display, rendering it almost invisible. The sensor was developed by Synaptics and was called the FS9500 Clear ID optical in-display fingerprint sensor. 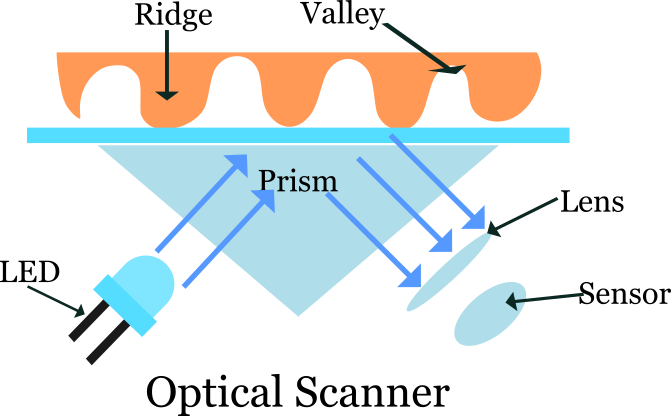 It works on the same principle as the earlier optical scanner but the prism is omitted. Instead, when the finger is placed on the display glass above the sensor, the screen illuminates and reflects the light on the finger, allowing the sensor to capture the data. The Synaptics FS9500 Clear ID optical in-display fingerprint sensor currently works only in OLED displays. Right now, it's not as fast as your traditional fingerprint sensor but is definitely much secure than the Android facial recognition. The same technology also be seen in the Huawei Mate RS Porsche Design. The Snapdragon Sense ID fingerprint technology uses ultrasonic sound waves to directly penetrate the skin and create a highly detailed, 3D digital map of a fingerprint. It can even penetrate materials like steel, aluminium, glass or plastic, which gives phone manufacturers more design freedom as they can place the fingerprint under these materials. It can accurately read the image even if the finger is smudged in sweat or mud. Finally, you might wonder if apps can read the fingerprint data stored on the phone. The answer is no. The data is secured in a Trusted Execution Environment, which is a secure area of a main processor. The fingerprint data is processed within the TEE itself for authentication.